Should a Danish paper have apologized for offending Muslims? The Telegraph reported today that Politiken, a Danish newspaper that printed a controversial cartoon of the Prophet Mohammed in 2008, has apologized for offending Muslims. The paper's editor has stated, "We have the right to print Kurt Westergaard's drawings, we have the right to print the original 12 drawings, we have the right to print all the caricatures in the world," he said. "We apologise for the offence which the reprint has caused. That is what we apologise for." Not surprisingly, Politiken's apology has attracted both negative and positive reactions. According to the editor-in-chief at Jyllands-Posten, which first printed the 12 cartoons, the apology "takes the first prize in stupidity." Another critic, Mr. Westergaard, stated, "I fear this is a setback for the freedom of speech." On the other hand, Muslim leaders in the country are thankful for the apology. One imam stated, "It is beyond any doubt that they have offended some people. It is a nice and human gesture that the newspaper apologises." What do you think? Do you think Politiken did the right thing by apologizing? Or, do you fear like Mr. Westergaard that the apology could be "a setback for the freedom of speech"? Vote in the poll below and please feel free to leave your comments! Christian youths who were arrested without warrant following an attack on believers leaving a Christmas Eve midnight mass service in Nag Hammadi, Egypt (click here and here to find out more) have reportedly been severely tortured at the hands of authorities. Two days after the shootings, nearly 100 Coptic teenagers as young as 15 were arrested randomly without warrants from the streets and their homes in Nag Hammadi and the neighboring villages. The arrested youngsters were tortured and released without charges after nearly one week, except for 15 who were charged with "rioting and resisting the authorities" on January 24, and sent to detention camps; 13 went to the New Valley Camp, 700 km south of Cairo and 2 went to Alexandria. It is not known how they are being treated there. "When we visit them, there is always supervision," said one relative. Those that were released confirmed that they were beaten and subjected to electrocution. They were asked by security forces to falsely testify against Bishop Kyrollos that he incited them to make demonstrations. Bola (surname withheld), 18, said that he was picked up from the street at 6.30 on January 8, and taken to the police station. Next morning they were blindfolded, with their hands tied behind their back, and transferred to the State Security prison in Nag Hammadi. "We had to take our clothes off, and we were electrocuted with electrodes in our private parts for 8 hours." He said "Electric shocks only stopped when we could take it no longer -- only to be resumed again." Reziky (surname withheld), 17, said he was picked up by the police from the street and was taken the next morning blindfolded to State Security prison. He described how they underwent electric shocks by being made to take their clothes off, stand barefooted, and drenched with water. "They electrocuted us through our private parts," he said. "We were threatened by security that if we disclosed what went on, we will be re-arrested." A relative of Reziky told an investigator he believes that Reziky and the others Coptic boys were also sexually abused by the police. Coptic News Bulletin conducted an aired interview with the brother of a 15-year-old teenager who was released, He wanted to remain anonymous for fear of revenge from State Security. "They tortured my brother, and the other Copts. They were flogged and electrocuted through their private parts. The doctor said that none of them will be able to father any children or get married," he said sobbing "He did not tell us exactly what happened. He is ashamed." He said that the police wanted them to falsely accuse Bishop Kyrollos of inciting them to go out on demonstrations. The brother said that his brother is under medical treatment but is suffering psychologically and is afraid to venture out of his home. At this time, please consider standing in solidarity with these young men and their families. First, please pray. Pray for their physical and emotional healing. Pray that they and their loved ones will remain steadfast in their faith (1 Peter 5:8-10). Pray that those who tortured them will repent and come to Christ. Pray that authorities will act justly in this case. Pray for strength and safety for the 15 who remain in detention. Second, please contact your MP, the Egyptian Embassy, and other authorities and voice your concern for these youths and the torture they endured. When writing please do not mention The Voice of the Martyrs, advance your political opinion, or include anything which could be insulting to authorities. For other addresses you can write, click here. To learn more about how to write effective letters to officials, click here. Finally, please share this story with your friends and family and ask them to join you in standing with these brothers in Egypt. In 2006, while attending my first Master of Fine Arts program residency, I had the pleasure of hearing Cairns give a keynote address at an annual arts workshop which ran alongside the residency. Cairns spoke on that year's theme: "Love and affliction: The paradox of art and suffering." The address was the seed of what Cairns calls a "study of suffering," in which he draws from the life and works of a wide variety of individuals--from prophets and poets to early church thinkers and classic literary authors. I find Cairns’ book to be a profoundly moving meditation on the questions raised by human suffering, including the relationship between God's purposes and our pain. In fact, so rich was my experience of reading it that I suspect it will be fruit for some future blog reflections, especially as I've had some more time to consider how Cairns’ insights connect to the particular affliction of Christian persecution. I thought it worthwhile for now, however, to simply bring this beautiful little book to your attention—and if any of you have read it I would love to hear from you. If you're interested in learning more about it, you can read an excerpt on the publisher's website. I'd also encourage you to check out the musings of another blogger whose entry on the book I happened upon recently and really enjoyed. You may be wondering where this blog's current header image -- a beautiful and lush landscape -- is from. I took this photo last fall while in Kandhamal district, Orissa state, India to meet with Christians who suffered severely in the August 2008 violence (click here to find out more about those attacks). While driving around Kandhamal to visit different villages and relief camps, I was struck by the splendour of the countryside in contrast to the ugliness of the demolished homes and churches. Here are some photos to give you an idea of the beauty of Kandhamal and the brutal devastation that was caused by the anti-Christian violence. After reading a recent BBC report that Chinese Christian human rights attorney Gao Zhisheng was "alive and working in Urumqi, and there has been [in] contact with his family," I wondered how his wife and children would respond to this latest rumour. After all, it was only weeks ago that an official told Gao's brother that Gao had gone missing while "out for a walk!" As it turns out, Gao's wife, Geng He, has strongly refuted this latest information about her husband. Gao was last seen in public in February 2009. Gao has been repeatedly kidnapped, arrested, imprisoned, and tortured by authorities for defending the persecuted. Gao was nominated for the Nobel Peace Prize in 2008. Around the same time, a Chinese informant then posted photos of Gao Zhisheng online in a Chinese report, claiming he worked in the same company as Gao Zhisheng. He said that Gao was a talkative, even funny man, who had allegedly become a successful operational manager, talking about his wife and family and even "whistling a happy tune" daily. On February 14th, the story broke to western media, leading to speculation as to whether the reports were valid. One American legal expert Chinese government's disclosure a "step in the right direction," but has called the Chinese government's treatment of Gao's case highly irregular. Gao's wife, Geng He has denounced the claim as false, greatly frustrated by the lack of communication and deception. Neither she nor Gao's brother or sister have been able to contact him, much less acquire "useful information" about his whereabouts and condition. ChinaAid President Bob Fu added, "With no evidence to suggest otherwise, this appears to be a ploy by the Chinese government to confuse people and cover up the truth. By telling reporters and advocacy organizations that Gao is in Xinjiang, it will keep them from hunting around Beijing for answers. The Chinese government is just playing games now." Please pray for strength for this family during this difficult time. Pray that the truth about Gao's condition and whereabouts will be revealed. You can also support this family by signing a petition calling for his release at http://www.freegao.com/. The site also provides addresses to write to leaders and encourage them to stand and support Gao. For the complete press release from ChinaAid, please click here. Hi there, and welcome to The Voice of the Martyrs Canada blog! 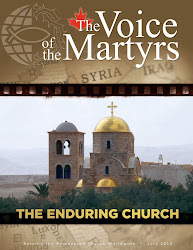 Some of you may have been followers or have read a few posts from the previous blog of The Voice of the Martyrs, which was largely managed by our former C.E.O., Glenn Penner. Glenn passed away from cancer in January 2010, and as the two of us looked towards taking more responsibility of the blog, we realized we needed a new space, a fresh forum, to uniquely connect with you. So, perhaps you’re wondering what you can expect from this blog. We hope first and foremost to share the stories of courage and faith from the persecuted Church. These testimonies have challenged and enriched us – and we hope you will be blessed by them as well. We also hope to provide you with ways to help persecuted Christians. People often ask us what they can do, and we hope to answer some of those questions. As we grow in knowledge and understanding of the persecuted Church, we hope to share insights with you along the way. We want to share with you books, videos, and other resources that we are enjoying and that we feel may further your understanding of the persecuted church. And, of course, we want to be able to dialogue with you, our readers and fellow pilgrims seeking to stay informed on trials facing believers throughout the world. Thank you for visiting our new blog! We hope you will come back often.